Like many other people, I probably suffered from reflux for many years without knowing it (mine is LPR – Laryngopharyngeal Reflux, but these recipes will be good for Gastroesophageal reflux**, too). Then, in September 2014, I lost my voice* following a nasty chest infection. For 3 weeks I had no voice whatsoever, but after minor improvements, my voice just wouldn’t get better. It turns out I have an unrelated issue on one of my vocal folds (focal cords), but I also had significant LPR at the time, which was aggravating the issue by keeping my entire throat in a constant state of inflammation. The added advantage of managing my reflux through diet has been significant weight loss. At the time of writing, it’s been 13 weeks and I have lost 9kg! My family and I have enjoyed varied and delicious meals throughout this time. I’m loving the challenge of cooking with different ingredients and with much less fat. My creativity has, yet again, been unleashed, so I want to share my recipes with the many other reflux sufferers out there, to help you enjoy delicious food while you manage your condition. 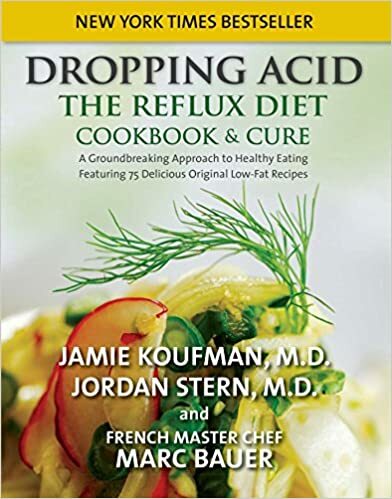 My fantastic speech therapist, who is working with me on managing my voice and therefore also my reflux, recommended Jamie Koufman’s ‘Dropping Acid – The Reflux Diet‘ book as a starting point and this was great. I strongly recommend getting this book as it will help you understand your condition and will give you clear guidelines of how to get started with managing your reflux. Every person is different and there are certain foods that are ok for some but not for others. I have, for example, found out that I am fine with garlic (thank goodness – I live off the stuff! ), but for some it’s a trigger. So please do adapt the recipes to remove ingredients that are triggers for you – whenever possible, I have suggested alternatives. The book recommends following a 2-week very strict, acid-free ‘Induction Reflux Diet’. I actually followed this diet for 6 weeks as it took that long for my reflux to settle down enough for me to be able to re-introduce certain foods (e.g. garlic, onions) and be able to tell whether they affected me or not (initially, everything affected me!). Some of my recipes use only ingredients allowed in the ‘Induction Reflux Diet’**, but I have also included ones that include a wider range of ingredients for the on-going reflux diet. *I am a professional speaker, so having a voice that sounds good and is reliably there for me is absolutely paramount to my ability to earn a living and do what I love. When I lost my voice, I had just launched a brand new programme into UK schools with two other speakers, and was very lucky that my colleagues could speak for me in my parts of the programme, though this is not a viable long-term solution, of course. **Please note I am not a doctor, speech therapist or in any way medically qualified. The recipes are a combination of my interpretation of the rules outlined in the ‘Dropping Acid – The Reflux Diet’ book and ingredients that work for my reflux. If you believe you suffer from reflux, please seek advice from a medical professional to confirm your diagnosis and work out the best course of treatment/management for you. I hope that my recipes can help you as part of this management. The recipes are, by their nature, very low in fat, so are also suitable for anyone wishing to follow a low-fat diet.